Abandoned by his unwed mother during World War II, Donald Vitkus becomes a ward of the Commonwealth of Mas­achusetts. He is 27 days old. Six years later as “Patient #3394,” he is committed to Belchertown State School, where he is labeled a “moron” with an I.Q. of 41. 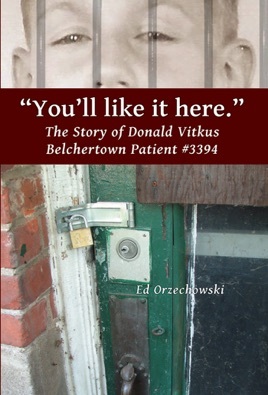 Like hundreds of other institutions across the country, Belchertown is a de-humanizing environment of barred windows, locked doors, and brutal regimentation.“I never want us to return to those days,” Donald says. You’ll Like It Here is packed with gritty, realistic detail, some of it darkly hilarious. Belchertown State School is the evil institution incarnate, itself a character, a brooding presence over the whole story. It is Donald's triumph that he is able to survive Belchertown. A powerful, poignant account.